When I was a kid, I loved having a corn muffin. I’d toast it and add sweet butter. I considered it an indulgent breakfast. When I got to the age where it was all about going out with friends dancing until all hours, there was always a late night (or early morning) diner stop before heading home. Sometimes there would be disco fries, sometimes grilled cheese with tomato and bacon, but mostly it would be a toasted corn muffin with cream cheese or butter. And what’s a corn muffin but individually portioned cornbread! So yeah, I kinda dig it. I think I’ve mentioned before that I just love my cast iron skillet. It’s become the most used pan in my kitchen. I love the sturdiness of it… the way it evenly distributes heat and makes cooking so much more fun. I’ve not done much baking in it so it was time to get it going. 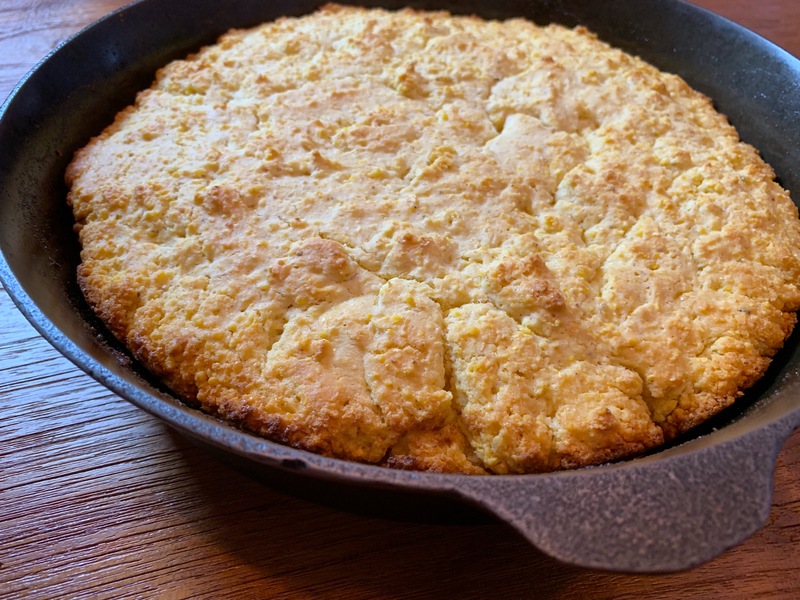 Making cornbread can seem daunting. 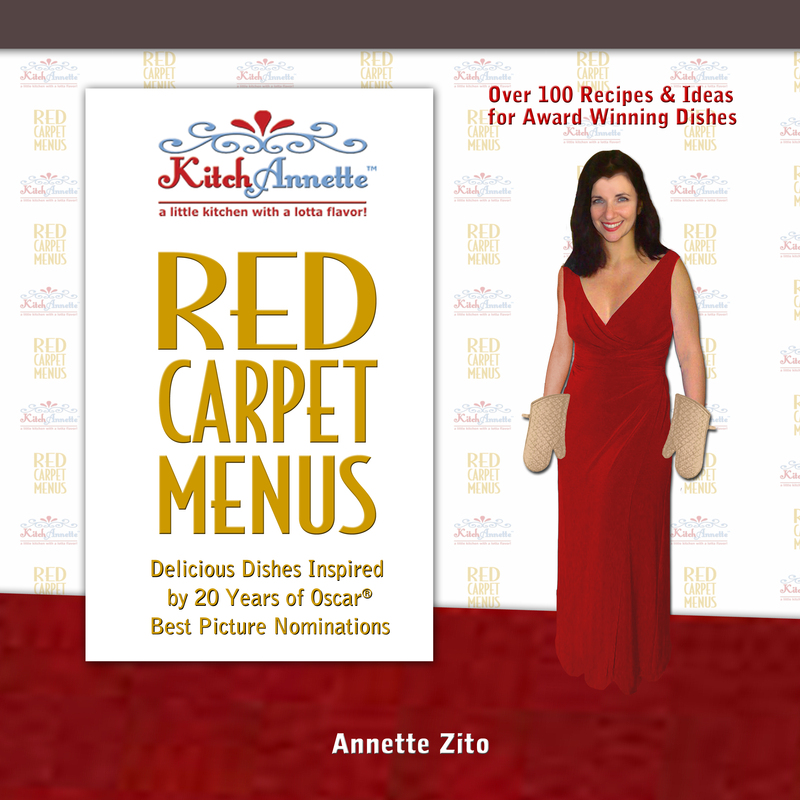 There are so many versions of what is considered an easy recipe. To use baking powder AND baking soda or not? What about buttermilk? One, 2, or 3 eggs? And how about oil versus butter? You’d think it would be pretty standard but it’s not. So yes, I did my research. 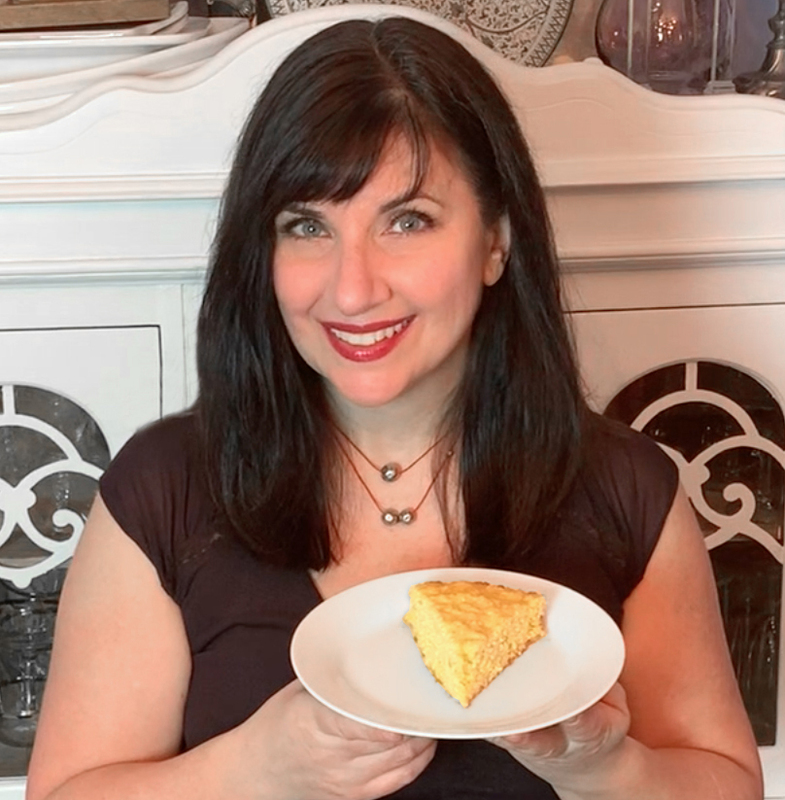 My recipe uses the most basic ingredients and takes but a few minutes to put together. 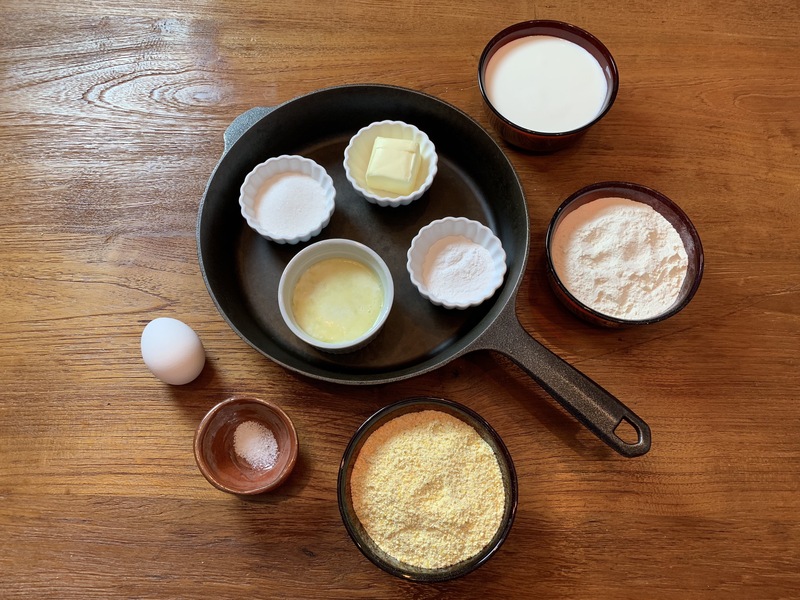 If you don’t normally have cornmeal in the pantry, it’s time! I am all for dropping in a few extra ingredients depending on how you like it. My mom likes some corn kernels mixed in. You can take it spicy by adding a few sliced jalapeño peppers! And there’s nothing wrong with adding a layer of your favorite cheese over the top about 5 minutes before it’s done to let it become a melted gooey delight! There is something so satisfying about cornbread. Whether made in a loaf, pan, muffin tins, or cast iron skillet, it is such a delicious treat. 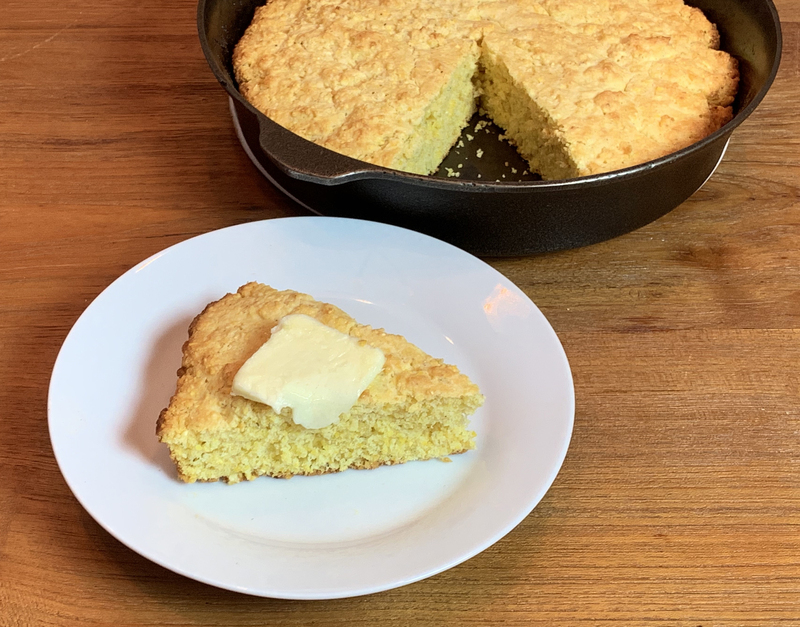 Warm and slathered with butter and honey or taken savory and paired with spicy chili or rich pulled pork… that crumbly texture dancing on your tongue… there’s a sweetness and corn flavor that explains why it’s one of the most popular quick breads around. Place 10“ cast iron skillet in the center rack of the oven and heat to 425°F. Whisk corn meal, flour, baking powder, sugar, and salt in a large bowl. Set aside. In a small bowl, mix in milk, melted butter, and egg, then pour into dry ingredients. Whisk until just combined. Remove skillet from the oven, grease with remaining butter, spread the batter evenly, and bake for 20 to 25 minutes or until golden brown. A tester inserted into the center should comes out clean. Cool for about 10 minutes before serving. You can use an 8x8" square pan or 9” pie plate instead of the skillet. No preheating required.Just grease before adding the batter and bake as above. If you want to use a muffin tin, again, no preheating. Just grease before adding the batter BUT check them after 15 minutes - smaller "little cakes" will cook faster. « It’s an App Attack! Bruschetta with Tomato, Basil, & Mozzarella!